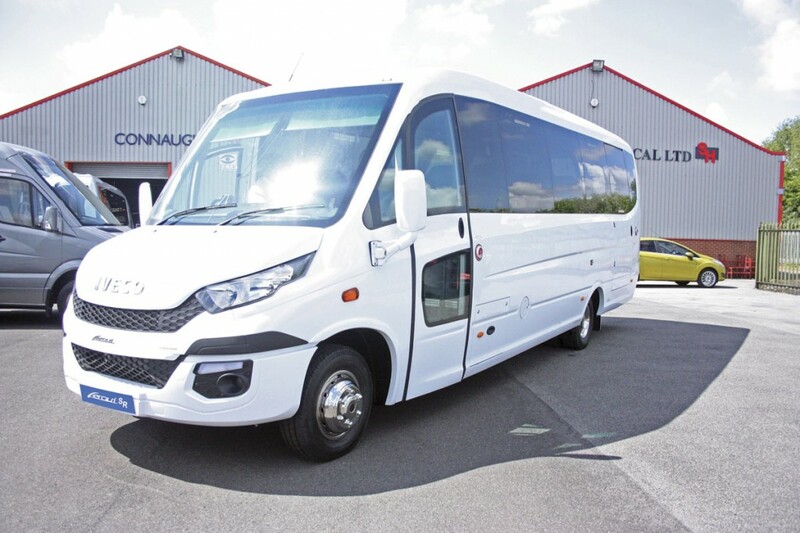 The first company to find a solution to the need for a truly value for money coachbuilt 33 seater minicoach since the disappearance of the Mercedes-Benz Vario chassis, is Connaught PSV with their partner Ferqui of Spain. 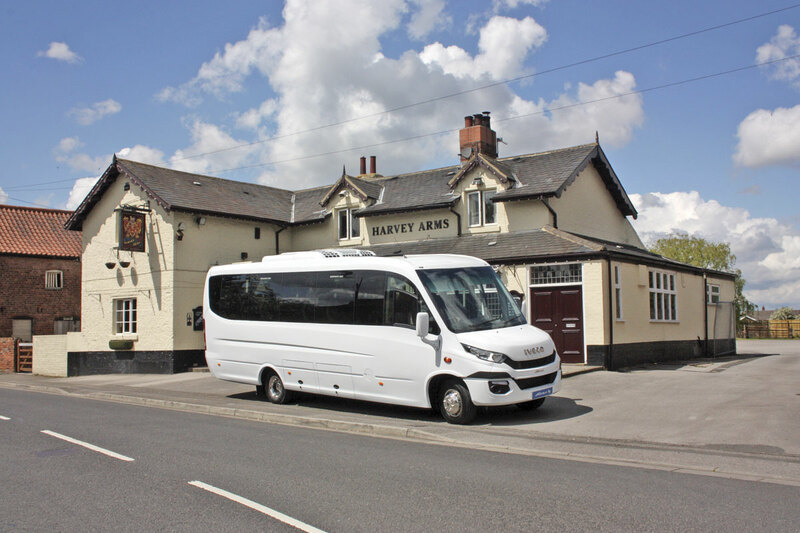 They have become the latest company to exploit the potential of the recently introduced Iveco New Daily chassis but the first to achieve the Holy Grail of 33 seats. The vehicle has an impressive unladen weight of 5.005 tonnes, a gross weight of 7.2 tonnes and an equally impressive price of £109,000 including VAT. The new Ferqui SR utilises the 72C17 Iveco New Daily chassis with a wheelbase of 4.75m. This translates into a vehicle with an overall length of 8.46m, width of 2.44m and height of 2.325m over the air conditioning pod. The chassis is fitted with Iveco’s 3.0 litre four cylinder, direct injection, turbocharged, inter-cooled diesel engine to Euro6 emission standard using AdBlue. The engine develops 170bhp and has a maximum torque of 400Nm across a wide speed range. The engine features variable geometry turbocharging for maximum efficiency, performance and fuel economy. This is matched to either the new Hi-Matic eight speed fully automatic transmission or a six speed manual transmission. Steering is powered. The front suspension is the new Quad Tor independent system and the front axle is plated at 2.5 tonnes. The rear axle of the rear wheel drive vehicle is fitted with self-levelling air suspension which has a raise and lower facility. The vehicle is fitted with disc brakes all round and incorporates ABS, Hill Hold, ESP, EBD, ASR together with Lane Guard and Proximity Limiter as standard. Electrics are 12v with a 210A alternator and 110 Amp hr batteries. 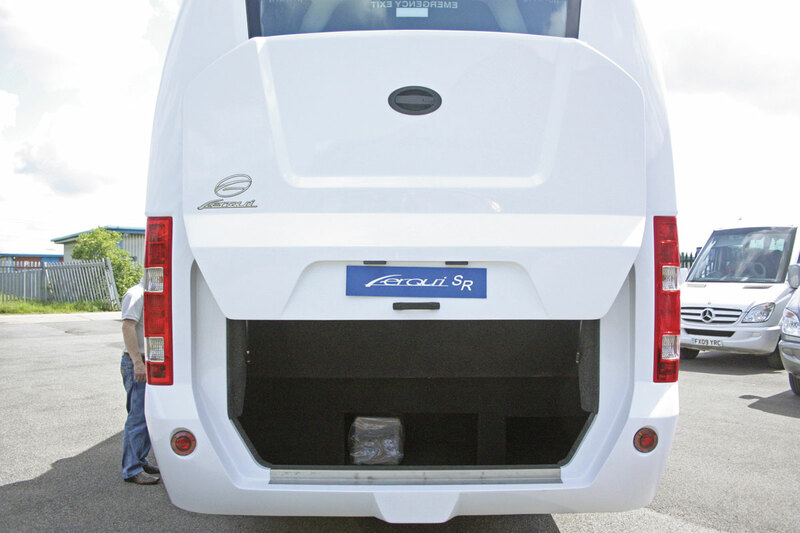 The fuel tank and AdBlue tank are mounted on opposite sides of the vehicle to avoid confusion. On to this chassis, Ferqui mount a body framework formed of square, galvanized steel tubes which meets all the required EU compliance standards. The body frame is packed with extensive insulation and clad in stylish GRP panelling. 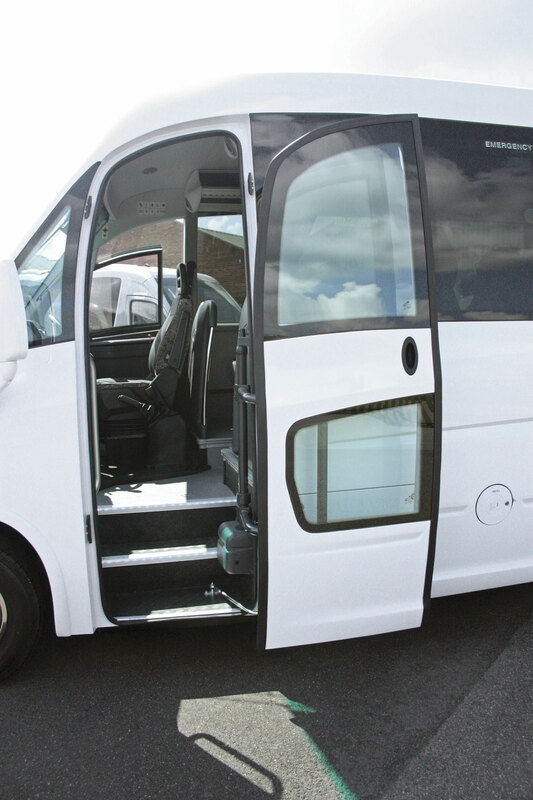 The entrance is fitted with an electrically operated glazed, powered, outward opening plug door which reveals a three step entrance leading to a flat saloon floor with M3 seating mounted on plinths. 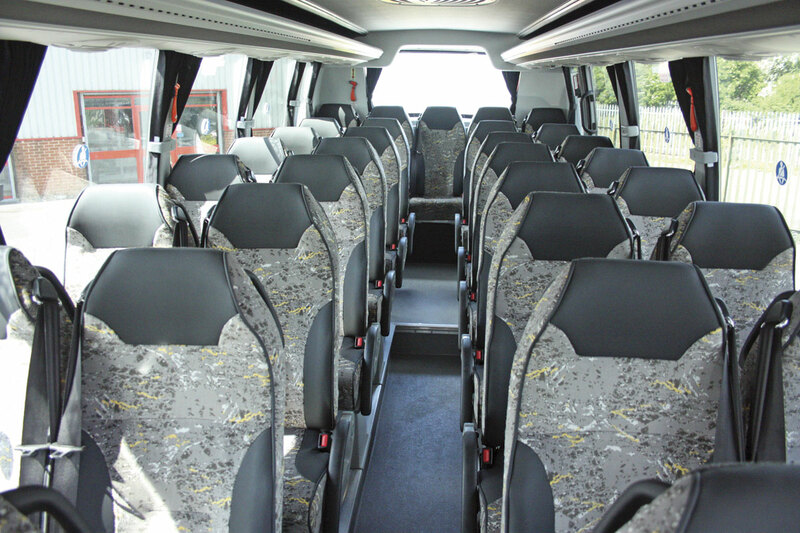 The vehicle is fitted with 33 Kiel seats equipped with grab handles, gangway armrests and three point belts. All but the rear row of five seats are recliners. In common with Connaught’s usual specification the emergency exit is mounted on the nearside. The interior of the saloon is trimmed in soft feel, wipe clean trim to the sides and roof. There are full length parcel racks down both sides of the saloon incorporating individual LED reading lights, air vents and speakers. The racks also house the LED saloon lighting including a night driving setting. There is additional LED lighting at the entrance. Glazing is bonded, tinted, double glazed panoramic units with full draw curtains. 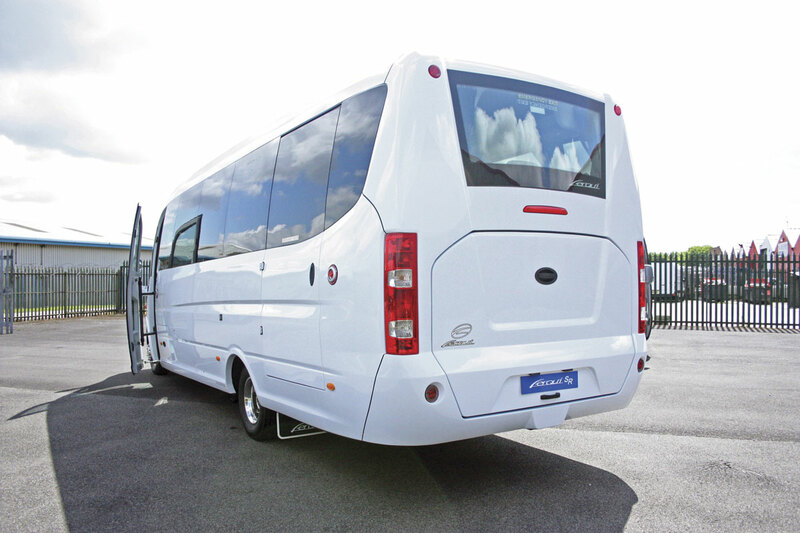 The vehicle features full length convection heating down both sides of the saloon and Diavia air conditioning. A roof hatch is also included in the specification. On the example I inspected this was a solid unit whereas I would prefer to have seen it with the optional glazed unit in order to increase internal light levels. 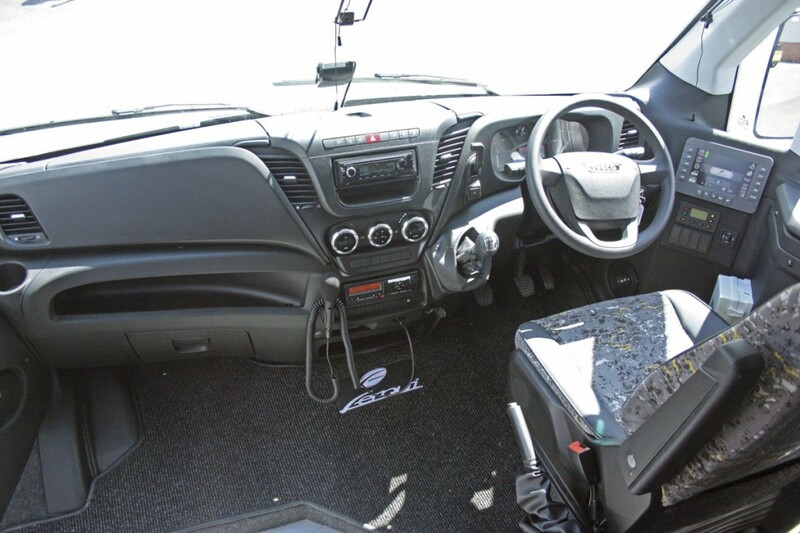 The cab is primarily standard Iveco New Daily in terms of layout. The driver’s seat is fully adjustable and is trimmed to match the saloon seating. 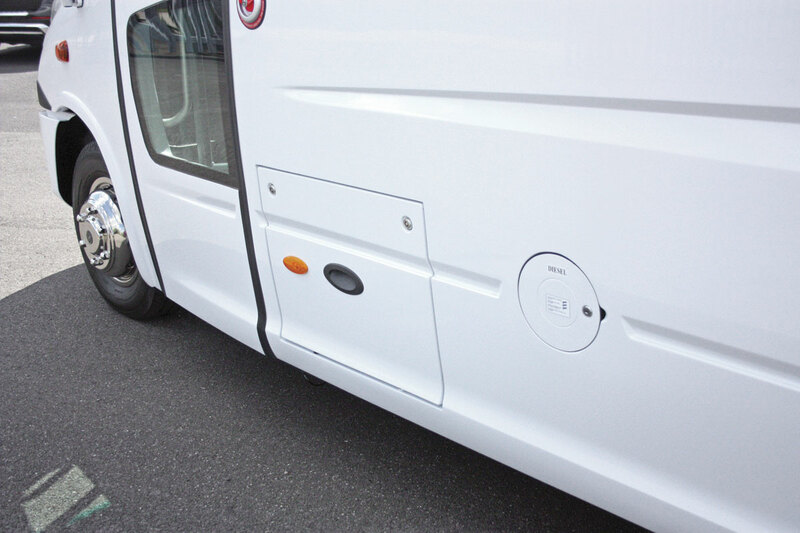 The driver’s window is electrically operated and the external mirrors are electrically adjusted and heated. The vehicle is fitted with a Bosch radio and CD player system incorporating a driver’s pa. The vehicle I was inspecting was not fitted with a reversing camera although this is part of the specification. 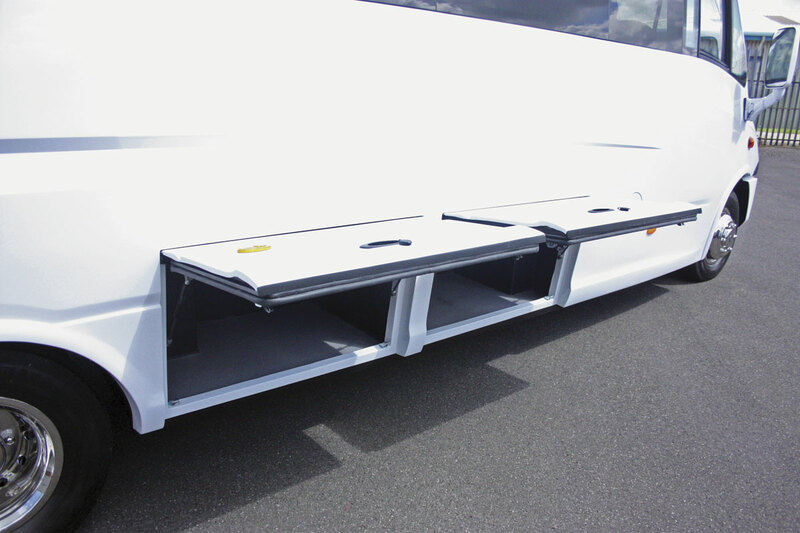 It has a luggage boot with a parallel action lift up door. There are also underfloor lockers on the off-side. The vehicle is very stylish in my opinion and the GRP cladding is to the usual high standard characteristic of Ferqui products. Equally the standard of internal trimming and general fit and finish is very high, again as I would expect of Ferqui. The example of the Ferqui SR I inspected was fitted with manual transmission. I was accompanied on my drive by Steve Peach of Connaught which enabled me to experience both driving the vehicle and riding as a passenger. The vehicle seating was very comfortable and the internal ambience was equally comfortable on what was quite a warm day. The ride, even at the rear, was very smooth and I was impressed by the structural integrity of the vehicle. There was no rattles or squeaks, no shake or shimmer, just a feeling of complete security. I’ve reported before on the Iveco New Daily when it is fitted with the 3.0 litre engine. The engine is not only powerful and with excellent torque characteristics; it is also very quiet even when travelling at maximum speed up against the speed limiter. Vision out of the big windscreen is excellent with little intrusion from the pillars. The mirrors also give good, steady rearward vision. Ride at the front is good and road holding produces a feeling of security with no hint of wander. Steering is light and precise and the vehicle responds beautifully making it a real pleasure to drive. The transmission is light and easy to use and gives excellent positive changes. The ratio spread is well planned allowing easy progression up and down the box. Braking equally is powerful, straight and secure. The new Ferqui SR really is a very nice vehicle and a valuable addition to the Connaught range of products and I think it will prove to be very popular with operators. It certainly represents excellent value for money. 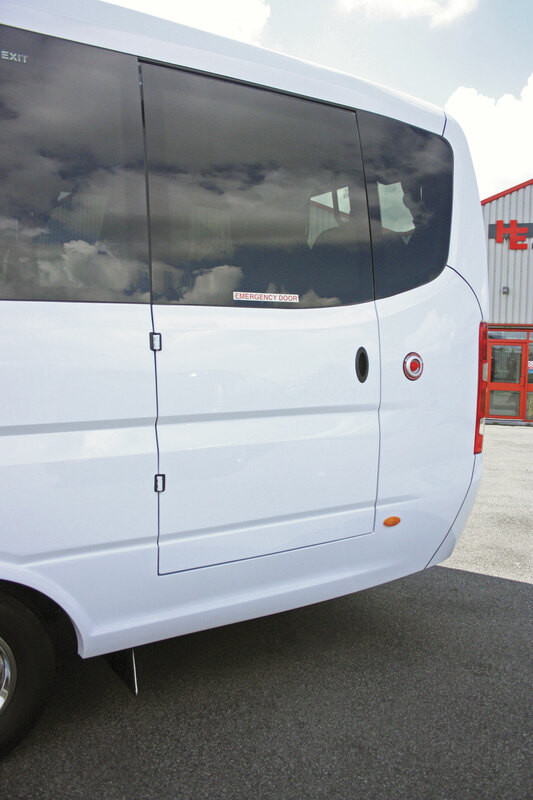 The chassis is covered by a three year Iveco warranty and the body has a two year warranty.